Oh, this is a sad one. Are middle grade books getting sadder? I'm not sure if it's because books about grief tend to get recognized for awards, but I don't know any young readers who love to cry when they read. 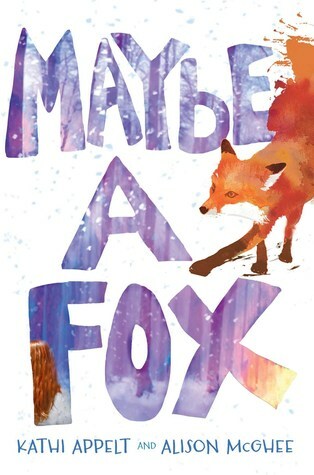 Still, Maybe a Fox is a great story about what happens when a beloved sister passes away. The twist is that we get the perspective of a fox who is connected to the girls. It all comes together in the end and had me bawling. That's why I think it would be better as a book that a parent reads a child than a book that a child picks up on their own. There are some interesting choices. Maybe a Fox takes place in the past, but the only reason we know this is because the older sister Sylvie always wore a Florence Griffith-Joyner shirt. I don't know what this would add to the story, except maybe that there are no cell phones that might help during emergencies. I also thought it was strange that there are actually two devastating deaths in the novel. While they parallel each other, it feels like too much tragedy for a middle grade novel. I will book talk it and tell students why I enjoyed it, but I don't know how many students will pick it up.